Alright – here is what I have been trying to do. If reading through this you get confused – well, now you know how I feel. The video below describes exactly what I have done to my four Baofeng UV-5R 2 meter Ham radio’s. I have followed the instructions exactly but to no avail it is not working. The entire purpose of my efforts is to create one or two back up repeaters as a back up to the local repeater in my area. I am not expecting the same range out of my home built repeaters however I am looking for some area coverage over what the stock radio’s are capable of. The antenna at the top of the peak above represents the repeater. The repeater allows radio’s that are otherwise too far apart to communicate to actually connect. Repeaters are excellent at getting communication around and over obstacles. 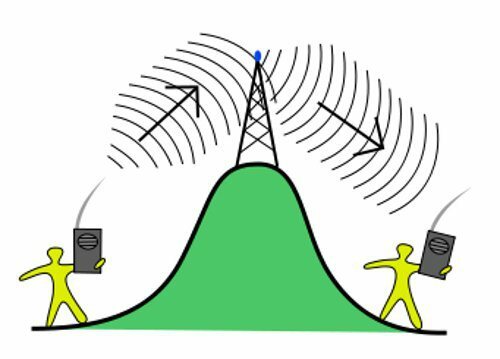 A repeater generally has a receive channel and transmit channel. 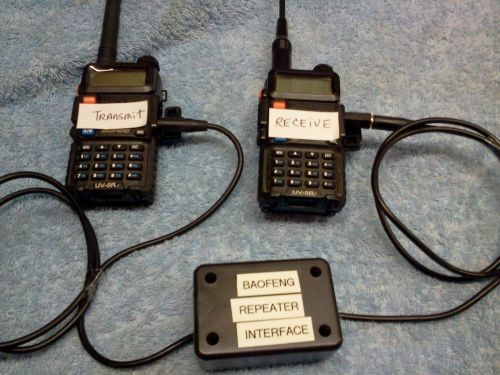 The HAM operator on the left transmits a message which is received by the repeater, and the repeater then transmits the message out to the HAM operator on the right via a different channel. The video below does an excellent job describing this better than I can write it. Trial #1: In the video a simple cable with a 3.5mm jack on each end along with one end using a 2.5mm adapter is used. I tried it – did not work. Result: The problem I had was that between the receive and transmit radio’s the transmit radio would constantly receive some type of static. Due to the constant static the transmit radio would “time out”. Trial #2: I purchased a “Repeater Interface” off of eBay. This repeater interface contains the same cable – 3.5mm on each end along with a 2.5mm adapter. The difference between the Interface and a regular cable in a “box” between the two ends. What is in that box? I have no idea. I was told there is circuitry to clean up the signal between the two radio’s. Initial trials provided the same static from the receive radio to the transmit radio. This static would cause the transmit radio to time out. Next – I tried a different 3.5mm to 2.5mm adapter – success!!!! Well – sort of. I was able to use Radio A to send a message, which would go from the receive radio through the Interface to the Transmit radio – and then to Radio B. Problem? The audio was extremely faint. I hoisted the “homemade repeater” up approx 35 feet in the air and tried it. The audio was too faint to hear and static was the result. Periodically rather than audio or static I would receive bursts of “noise” – consistent in nature and it would come as long as Radio A or B was keyed up. Trial 3: I tried the same thing as Trial #1 except with a different cable. The constant static between the Receive Radio and Transmit Radio did not happen. This was great except when I keyed up Radio A all that went to Radio B through the Repeater was static. So – this is where I sit…..pretty damn frustrated. I have put a lot of time into this and can’t figure out how many others out there have had success and all I have is failure. “Pat” left a comment and suggestion to check out a Simplex Repeater – offered HERE. That is certainly a consideration. “talkingbear” also suggested a Simplex Repeater – HERE. I know some experienced guys (and gals) out there may be saying – “What an amatuer….” and they would be right. Communication is a vital part of a preparedness system and being able to reach family members and members of my group are high on my priority list. Budget restraints exist and 2-meter HAM should fit the bill. If anyone out there has any first hand experience – and maybe solutions – please pass it on. This likely will not just help me but many others as well. Please Like us on Facebook!! The Coach feels your pain. I got my Ham Tech license about 10 years ago. I had so much trouble that I just gave up on the Ham radios. Yes, it would be very advantageous to have but sometimes you need to know when to just say thats it and stop. The following may not work but it costs nothing and only takes seconds. Try separating the two radios by at least 10 feet. When too close together they may interfere with each other. Did you in gauge your PL or DSC when you tried this. This may work for you since you are adding a tone for both TX and RX. Use Ham Freq`s only.146.00 -148.00. The video is not in ham bands.The 3.5 plug goes in the MIC one HT and 2.5 goes in the spk port on HT two. Would a cross band repeater (VHF UHF, or 2m 70cm) work? Puxing makes a handheld that has a cross band repeater built in, the PX-UV973, for $80. Or the TYT TH-9800? i have had only limited success with the Baofeng. There are issues that have escaped both me and my elmer with these radios to the extent he basically told me to avoid the China junk. I know you are in the same boat as me being limited funds but I agree with elmer, you get to a point of diminishing returns and buying the right tool is the way to go. Temper that statement with I have never tried to build a repeater. I have had great success using the radio’s for their intended purposes as many others have. As far as a handheld HAM radio to reach out to a repeater – awesome! I bought 2, and they have different issues. 1 refuses to accept programming in of radio freq’s, both manually and with the programming cord and the CHIRP software. the other has issues on both transmit and recieve where no matter the antenna or distance from the repeater, steam and bacon on my TX and their RX. I believe I have just 2 crap radios. I cant justify attempting to purchase another when I am batting 1000 right now. Besides, I have an Extra class license and I will save up for the ICOM IC 7200 and a few portable antenna arrays. I would like to buy a radio that has the 160m-70cm bands in one radio but they seem to be a compromise of features and capabilities.But hey 160m-6m is a good radio and the 6m band(called super 6) in my opinion is much better freq range than just about any other band. What I have found with these Baofeng radios is that the jacks for the mic & earbud are not of good quality. I get noise and even broke one radio which needs a mic to TX. I opened the radio up and decided it is not worth my time to replace the jack. But, maybe opening up the radio and replacing the jacks with good quality jacks and shielded cable will improve your setup. A cool idea once you get a couple of radios that do the job. I understand the idea about using cheap radios. Hate to lose that nice Icom of Kenwood to theft. RoosterVT – Excellent information. Upon inspection of my radio’s I found that the Receiver Radio which I plugged the 2.5mm plug into was a bit loose. I reversed the settings on the radio’s and swapped the ends and so far it appears to be working – at least in my garage. Next is to hoist it up 40 feet and try it out. Appreciate it. I hear you–it’s an investment but man oh man does it work well. My entire community use handhelds and hits this within 20 miles–effectively giving ALL of them a 50 watt base station. It plugged right into the Vertex mobile I have in a “beater” 1994 Toyota pickup. The advantage is that this will run for a week before I have to stop by and run it to charge and it repeats with a full 45 watts from a solid antenna base. This lets me set up message points and links that double my base range when needed. It took a little while to add a number of these but, it was well worth it! Thanks Macgyver – I like that Icom HT. As far as the repeater – too rich for my wallet but I am sure it works great. I am now looking at a rather simple Simplex repeater. Appreciate it. Understand. Forgot to mention that funding was a joint venture with other members of the community. Now, they all purchase the Icom HT and a car charger and they’re good for extended emergencies (because they can charge HT from vehicle, starting it once a week) with access to everyone else in the community (at least key nodes that can relay messages). One other thing to consider if you’re trying to reach further and up and over terrain–troposcatter. Let’s you reach over mountains on VHF and UHF with HTs and a Yagi. If that’s what you’re trying to do, hollar and I can help with details. It’s ham or Ham, definitely not HAM. Is it Dillon or dillon? I agree with Geeknik 100% and have done the same. But, I can’t ask everyone in my community to do the same. They can’t afford it. The system we fielded only requires a $150 investment and then grandma can reach another node during emergencies for help. Plus, those of us who have done the full setup can receive and relay worldwide news and information that we get on our HF rigs. I talked to a friend tonite who is an electrical engineer and an advanced ham radio operator. He didn’t think just using 2 radios to build a repeater was feasible. He suggested that using a simplex pocket repeater (I have listed a website for it below) might work with your 2 radios. He said that your radios would have to have removable antennas, and u would need a longer antenna for each radio. Antenna length would depend on your location (hill or mountain top, valley, flat land). If u tell me which of these fits your location, I can ask him what antenna is needed. Of course, u need extra co-ax etc. Hope this is of value to u. Appreciate the help vandal67 – I have reached the same conclusion that a Simplex Repeater is my next step. Working on my current build has led to dead ends where it SHOULD work. Oh well. One question you could ask him is just how long a cable could I attach to a Baofeng UV-5R 4 watt radio. My goal is to just have the radio located up in a tree or on top of something and a long cable will not be necessary however I would like to mount an antenna up as high as possible for other applications. Where will the cable from the Baofeng be going, to the antenna? “When the boogeyman goes to sleep, he checks his closet for Chuck Norris.” Sorry, wrong post. What troubles did u encounter getting into ham radio? If I can help, I would be glad to. Check the loss on the above link at the frequency you intend to use. It matters a LOT. I am an electrical engineer and would be happy to provide recommendations if you describe what you’re trying to achieve. Feel free to contact via email if needed. Appreciate the info Macgyver. Right now I am just using inexpensive HT radio’s. I was interested in running an antenna up a tree- possibly 20 feet or more and not sure how that will effect my ability to reach out. That’s doable–at 20 feet the Beldon 9913 will loose very little. Getting above the treeline has a dramatic effect on range. Do you need receive and transmit from all directions (omni) or is there one direction you need special emphasis on? Take a fishing line and sinker and shoot the line over the highest branch you can find. Put your radio in a white gallon jug (empty bleach bottle works great) with a flap slotted on the side (don’t remove the plastic just cut a flap) and cut several drain holes in the bottom. Be sure to keep the cap on. Put the radio in the jug and hoist this up with your fishing line. The white jug keeps the rain off and prevents overheat of the black radio in the sun. Get spare batteries and you can run this continuously. Keep in mind that battery life will be much shorter if you’re making the radio transmit a lot. Found something similar. The cost was 18.50$ when I first found it. Comes with the connectors like the speaker mic. Not sure how well it works, maybe I will order one to futz with. RoosterVT – I tried a similar cable and had no luck. I have now purchased a simplex repeater and so far working well. Will be writing more in it as I do more testing. There is an article being published Monday here that describes what I am planning on doing. Check it out. Glad to see folks own up to failure, it keeps others from doing the same. Thumbs up for the effort, i cant say i would of done anything different.